I’m blogging earlier than usual today as Karin is at the gym and I am up to answer any questions for our new nurse who just started. The first day with a new nurse is always a bit of work to put together. They need to get to know Liam. They need to get to know us. More importantly we need to get to know them and whether or not they will be a good fit for our family. These people are in our home; having a nursing degree and some experience is not enough to ensure that they’ll work out. So far so good with this nurse. She seems knowledgeable and pleasant enough. One concern is that she is allergic to cats. I can’t tell you how many times we have told the agency about our cats but nurses who are trained to handle trach and vents aren’t all that common and sometimes we have to take what we can get. Our usual daytime nurse needed to take some time off which Karin and I can completely understand. It will take some time before we can both leave the house or sleep late again. Hopefully this new nurse will catch on quickly and Liam will like her and we can get back to planning our mornings to include running errands and going to the gym together. We’ll see. Liam hasn’t woken up yet so we aren’t even sure how he will respond to her. I think he’ll like her but we’ll see. Liam did great at his pediatrician’s appointment yesterday. To get all the dirty details out of the way he is now weighing in at a lean 21lbs 7oz and 27inches long. He is now officially, and for the first time in his life, tracking along the growth curve. Gone is the ever increasing chunkiness he’s now a lean mean pooping machine. We discontinued one of his GI meds and are on our way to getting rid of another in the next month. Yay! 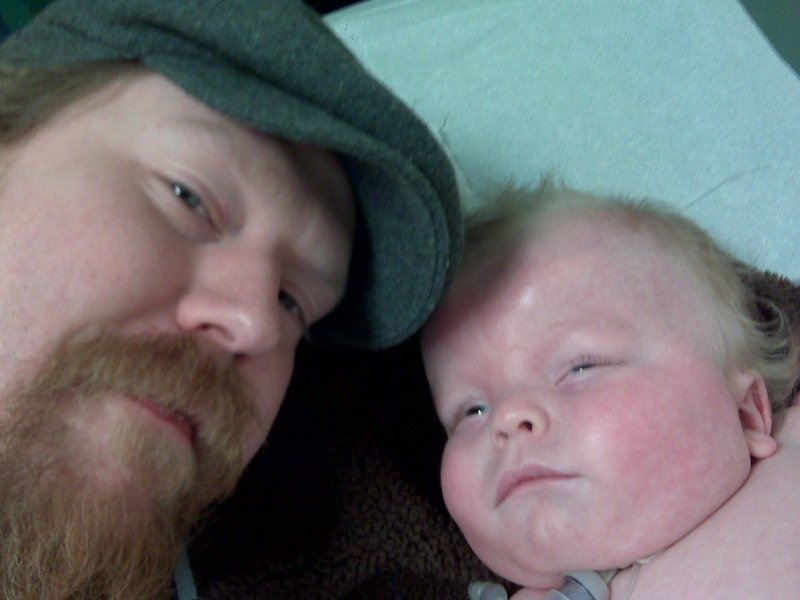 Liam and his daddy at the Doctor’s office. He had to get his 12 month immunizations and so got 3 shots all at once and then needed a blood draw to check a CBC and Electrolytes. My boy is one tough cookie because he took all those needles like a champ. HE even fell asleep as the lab techs in the office hemmed and hawed over where oh where to stick him for the blood work. They were so distraught made worse by the fact that when they asked where he would get blood work when in the hospital Karin told them that he had to have a central line put in by a surgeon. They were not happy to hear that. They did their jobs well though because since they took so long t find just the right spot once they did stick him they were able to get everything they needed rather than be forced to make multiple attempts. After his appointment we all came home and since I had the day off from work we were all able to take a nap in the living room together. Wonderful Quiet. It was a wonderful day. There truly is nothing better than taking a nap with the boy. So there you have it. Liam has had an exciting couple of days and is still sleeping as we speak. It is possible though that he is playing possum and pretending to sleep because he doesn’t know the strange older woman sitting next to his crib. He does that sometimes, hoping that if he doesn’t open his eyes the strange woman will just go away. No such luck buddy, her shift ends at 2pm. ← Can you fall asleep with the hiccups?